How do you feel about this statement? Does it resonate with truth for you, or does it sound cliched and trite? Do you find comfort in those words, or do they do nothing for you? Her experiences resonate powerfully with me, living, as I do, in a similar family situation. The building resonates with historic significance. My wedding day - and I know it"s a clich¨¦ - was just the happiest day of my life. The movie is teeming with obvious and trite ideas. He just sat there making banal remarks all evening. That"s the old hackneyed phrase, but it"s true. According to a recent, unscientific and informal poll of my Facebook friends, opinions range from cynical and dismissive to a belief so strong in these words that one person has them tattooed on her shoulder. Some historians have been dismissive of this argument. 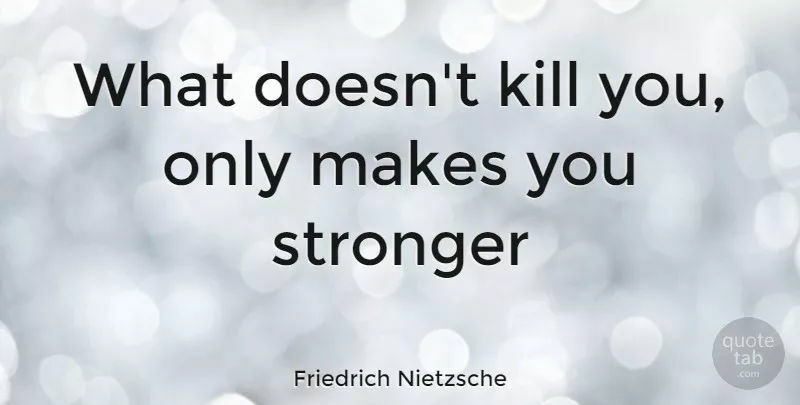 The idea that what doesn"t kill you makes you stronger is based on the theory that by going through difficult experiences, people build up their strength for the next, possibly more painful event that may occur. This can be a comforting thought, especially during a trauma ¡ª that all of the pain one may be suffering will be rewarded with a stronger sense of inner courage and the ability to take on the next painful life event. I"d been through the trauma of losing a house. It can be viewed as a badge of honor ¡ª a war wound, so to speak ¡ª to come out of a really awful time feeling more brave, more powerful and more ready to take on the next battle. That"s not how it"s been for me, though. I have found that after especially hard times I am weak, exposed and sad. If I was supposed to get stronger, then most of the time I was doing something wrong. Can I just say it was an enormous relief to hear him say that? You mean, I don"t have to be strong all the time? I can feel unhappy about things that happened in my life and not have to always grow from the most awful experiences? Sometimes, things are just bad? Yes. Sometimes bad things happen and we don"t grow stronger. Sometimes we just feel... bad. As I learned from my Facebook friends, many people believe that they have grown stronger through experiencing horrendous, life-altering experiences. I admire them for the strength they"ve found through adversity. And it"s true, some difficult experiences have led me to be a stronger person. He described it as the most horrendous experience of his life. But I have to agree with the doctor in that the really big things, the things that changed my life without my consent, the loss of loved ones, the terrifying experience of having a sick child and not knowing what was wrong, being desperately lonely or panic-stricken with anxiety ¡ª there has been nothing empowering about those times. I"ve felt my heart break and my soul sucked dry, but I haven"t felt stronger after the worst days. I"ve only felt grateful that they were over. Panic-stricken travellers fled for the borders. Most of the time, strength doesn"t come from life"s worst moments ¡ª it comes from the best. I feel strong because I"ve been loved ¡ª and am loved ¡ª by some amazing people, and because I"ve loved them back. I find strength in the times when I"ve been most generous and caring. I find strength in my ability to sometimes deal well with the bad days, to look for help when I need it, to disappear when I have to, and to re-emerge when I"m ready. I"m allowed to be sad and unhappy about the things that have hurt me in my life. I don"t feel like I"m strong because of them ¡ª but I do feel I can be strong in spite of hem.